Food, televisions, computer equipment, plumbing supplies, clothing. Much of the material foundation of our everyday lives is produced along the U.S./Mexico border in a world largely hidden from our view. Based on gripping firsthand accounts, this book investigates the impact of the North American Free Trade Agreement on those who labor in the agricultural fields and maquiladora factories on the border. 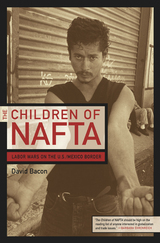 Journalist David Bacon paints a powerful portrait of poverty, repression, and struggle, offering a devastating critique of NAFTA in the most pointed and in-depth examination of border workers published to date. Unlike journalists who have made brief excursions into strawberry fields and maquiladoras, Bacon has more than a decade's experience reporting on the ground at the border, and he has developed sustained relationships with scores of workers and organizers who have entrusted him with their stories. He describes harsh conditions of child labor in the Mexicali Valley, the deplorable housing outside factories in cities such as Tijuana, and corporate retaliation faced by union organizers. He finds that, despite the promises of its backers, NAFTA has locked in a harsh neoliberal economic policy that has swept away laws and protections that Mexican workers had established over decades. More than a showcase for NAFTA's victims, this book traces the emergence of a new social consciousness, telling how workers in Mexico, the United States, and Canada are now beginning to join together in a powerful new strategy of cross-border organizing as they search for economic and social justice. David Bacon is a journalist and photographer. He is an associate editor at Pacific News Service and a regular contributor to The Nation, The Progressive, Z, The American Prospect, and the L.A. Weekly. His photographs documenting the lives of the workers discussed in the book were recently exhibited at the Oakland Museum of California as well as in Germany and Great Britain. His work can be seen at http://dbacon.igc.org.